LOS ANGELES, California, January 6, 2011 (ENS) – A new technology that uses seawater to remove pollutants from the exhaust of ships’ auxiliary engines and boilers will be tested for the first time on a container vessel visiting Southern California in a three-year project starting this coming spring. Co-sponsored by the Ports of Los Angeles and Long Beach, the $3.4 million project is expected to reduce the ship’s sulfur oxide emissions by up to 99.9 percent and particulate matter by as much as 85 percent. “Many of the ocean carriers are looking for ways to reduce their vessels’ emissions and projects like this are an ideal way to demonstrate the effectiveness of new technology to the industry,” said Port of Long Beach Executive Director Richard Steinke. 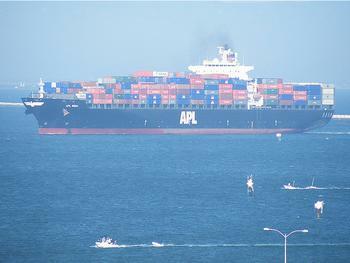 Funded in part by a $1.65 million grant from the Technology Advancement Program, TAP, a joint initiative of the ports of Los Angeles and Long Beach, the seawater scrubber filtering technology will be tested on an APL container vessel. The seawater scrubber, supplied through a partnership between Bluefield Holdings Inc. and Krystallon, Ltd., features advanced emission control technology in which seawater is used to scrub, or filter, contaminants from a ship’s auxiliary engines and boiler before exiting the exhaust stack of a ship. Once solid carbon contaminants have been removed, the seawater used during the scrubbing process is treated and cleansed before being discharged. The solid contaminants are contained and collected for later disposal. As part of the three-year project, the scrubber technology on the APL test vessel will be evaluated over a one-year period during the ship’s calls to the San Pedro Bay ports. It is expected to result in air pollution reductions of some 80 to 85 percent in diesel particulate matter, 99.9 in sulfur oxide emissions, more than a 90 percent decrease in volatile organic compounds and another 10 percent reduction in nitrogen oxide pollutants. Diesel particulate matter is classified in the state of California as a toxic air contaminant based upon its potential to cause health problems and cancer. Sulfur oxides, VOC and nitrogen oxides are gases that contribute to smog. The Technology Advancement Program was created as part of the San Pedro Bay Ports Clean Air Action Plan, and focuses on accelerating the commercial availability of new clean air strategies to reduce air pollution. Jointly funded by the ports of Los Angeles and Long Beach, TAP has provided more than $5 million in project funding since the program began in 2007. The U.S. Environmental Protection Agency recognized the ports with the 2010 Clean Air Technologies Award for the TAP program.